From the Warp: Are resin bases right for your army? I've done a good amount of work with resin bases over the past year and I realized something the other day. Resin bases are not for everyone. They may not be right for you. But how do you know? Good question. 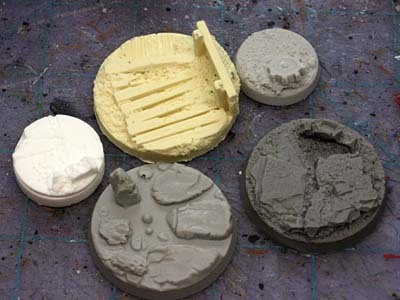 Resin bases are not right for you if you answer no to one or more of the following questions. 1. I know how to pin my models to their bases securely. 2. I like painting detailed bases for my models. 3. I know how to work with resin and don't mind the extra prep work. If you answered no to any of those questions, you might want to give a second thought to putting your army on resin bases. If you answered yes to all those questions, then resin bases might be just the thing to make your army really stand out on the tabletop and create a great looking force with a unified theme. First, you'll need to know what kind of theme you want. After that, it's a matter of picking the right base from the right provider out there... are there are lots of them. Two of my personal favorites are Secret Weapon Miniatures and Dark Art Minatures. Once you have your bases, you'll need to do all that extra prep work that comes with using resin. You don't mind doing it, remember? After you've got something you can actually use, it's time to pair up your models with their new bases and pin them all in place. Remember, the base makers are interested in making great looking bases... but this doesn't always translate into bases that models sit on top of perfectly without any issues. Then you think about painting them. It's a good bit of work when you get right down to it. But the end result can be amazing if you're willing to invest that extra time and effort. I am trying out resin bases for the first time on my WM stuff. Compared to 40K or WHF there are a lot less models so I figure it's a a good choice for a test. Hoping they turn out well as I can't figure out what sort of normal base would go well with the paint scheme I am using. At least you provided us with appropriate resources so that I could realize and rectify my mistakes. I especially liked the Corbania Prime link. I would have never thought of using the metal tabs for pinning models. Too bad I've already chopped them off my current works-in-progress. I would say, be very careful with resin. Resin dust from drilling or scrapping can be hazardous to your health. Also, I would not recommend putting any heavy metal models on a resin base, unless it is reinforced with a stronger material, as it will break under the weight of the metal model. Hmmm, just wondering, where could I get any resources on the toxicity of resin itself? I've never found anything reliable. Ron, thanks for listing Secret Weapon as one of your favorites -- I'm really flattered! @blang86: Although leaving the tab on can save a step I usually cut it off for mine as I find a pin in the foot (I use paperclips!) is sturdier. @Old Shatter Hands: Although some resin is very brittle I haven't had any problems with heavy metal models (heh) before -- I can't speak for the quality of all companies out there but I have some Rackham orcs on my 40mm and 60mm bases for display and I've dropped a couple of them without injury to the base. @Ergotoxin: I'm in the same boat. Working with Secret Weapon Miniatures means I work with resin all day - almost every day! - and I can't find reliable information either. One thing we can be sure of though is that breathing in fine dust - such as plastic dust creating from sanding resin - isn't good for your lungs. Thanks again for the link and the praise - you've made my day! You can find MSDSs for resins around on the web. Basically the stuff isn't particularly toxic. It's not a carcinogen and not listed as a hazardous material. However, as Mr Justin said, don't breath the dust. If you are doing a lot of work with it, wear a dust mask and don't work in a breezy area or it will get blown all over everything. Once you are done, vacuum up the debris. If all you are doing is cleaning of flash and putting pins in though you don't even really need to bother. If you are a decent painter and want one of the best looking armies at a tournament, resin bases are the way to go.